Learning to read a Pro Forma statement may seem daunting at first, but it’s actually pretty easy to digest once you know what all the terms mean. In this article, we will use an example to try and break down every line item, one by one. Assuming each of the 16 units rents for the same amount, we can back track to determine how much rent each unit generates per month. Back calculating isn’t always necessary, but in the event the Pro Forma statement doesn’t provide individual unit information, we can still easily calculate to find out. Commercial apartments oftentimes have coin operated laundry facilities that actually help generate additional income. Further, if the unit charges fees for parking, or has a vending machine, you can count this additional income and group it under the Other Income section. In this example, the section is titled “Laundry/Other Income”. The Scheduled Gross Income the sum of the Scheduled Rent and the Other Income. It is commonly used in most Pro Forma statements and is the total annual gross income the investment is expected to generate, assuming full occupancy (0% vacancy rate). Because actual vacancy rates cannot be accurately predicted, almost always, a fixed percentage assumption will be used. Most sellers, or marketers will underestimate the actual vacancy numbers in an attempt to “juice” the return on investment to entice potential buyers. In this example, 5% vacancy is assumed. For the conservative investor, it is always a good idea to budget an even higher number, say 10%. Also, any costs associated with filling a vacancy need to be accounted for in this section. For instance, any fees associated with listing the property, lease up, lease renewals, background check, open house showings, etc. However, be wary of any Pro Forma statements where the seller is already baking in vacancy rates of higher than 10%. This may be a red flag that the prospective property has difficulty retaining quality tenants. The only way to get a close approximation of actual vacancy rates for a property is to insist upon the seller to release to you the rent roll for the last few years. In this example, the vacancy assumption falls under the “Less Est. Vacancy Loss”. The Effective Gross Income is calculated by taking the Scheduled Gross Income and subtracting out the Less Vacancy assumption. You can think of it as the annual gross income you would realistically expect to generate. In the real world, vacancy is unavoidable and must be accounted for. The operating expenses appears in the “Less Est. Expenses” row. Net Operating Income is the yearly cash flow (before taxes) received from all units over a given year. It does not factor in any debt service. To calculate Net Operating Income, take the Effective Gross Income and subtract the Operating Expenses. The use of CAP Rate implies that the property is being purchased all cash without the use of financing. Debt service is not accounted for in the CAP Rate equation. If the CAP Rate looks too good to be true, it typically is. The “true” CAP Rate, known as the Effective CAP Rate, looks at the complete picture, and also accounts for operating expenses (property taxes, insurance, property management, landscaping, utilities, etc.). 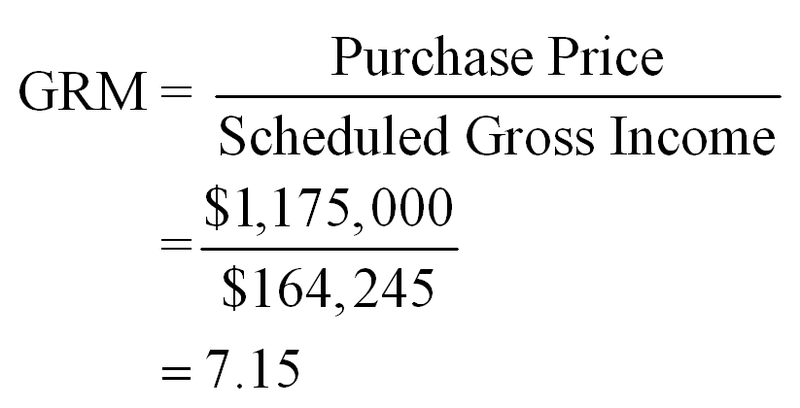 The numerator, “Scheduled Gross Income” is replaced with “Net Operating Income”. Often times, an honest Pro Forma statement will simply provide the Effective CAP Rate in absence of the gross CAP Rate. However, never take for granted that the CAP Rate number advertised is indeed the Effective CAP Rate. Sellers will often times try to make their numbers look better than reality by only providing the gross CAP Rate. You must double check to make sure the Cap Rate provided is indeed the Effective CAP Rate which accounts for Operating Expenses. The use of Debt Service implies that financing will be used to purchase the property. To calculate the annual Debt Service, we first need to know the terms of the loan. Note: Since this is a commercial building, the terms of the debt service using a commercial loan are not as straight-forward as they would be for a residential loan (fixed 15 year or 30 year rate). In this example, a 1st loan of $881,250 (75% of Purchase Price) is obtained at 3.70% financing fixed for the first 5 years, amortized over 30 years due in 30 years. The Debt Service numbers shown above would be valid for use in Year 1, but would have to be updated after 5 years to reflect the new interest rate. 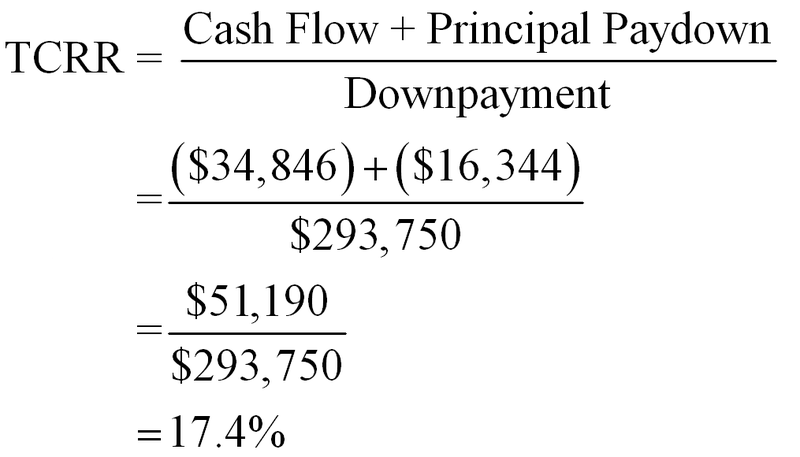 In the Pro Forma statement, the Cash Flow is found under “Pre-Tax Cash Flow”. Cash-On-Cash implies the use of financing. In a low interest rate environment, it can be advantageous for an investor to make use of leverage (“cheap” debt) since the Return On Investment (ROI) will be greater. Further, many investors like to use leverage to reduce the amount of Downpayment needed to purchase a property. In addition, the benefits of principal paydown and tax deductible interest can be gained through the use of leverage. If no financing is used, the Cash-On-Cash return will exactly match the Effective Cap Rate. The Return On Investment (ROI) is equal to the Effective CAP Rate, which is equal to the Cash-On-Cash. The Return On Investment (ROI) is the annual return of the investment property. Depending on whether the buyer elects to purchase all cash, or through financing, the ROI will vary. An added benefit of using financing, as mentioned previously, is the Principal Reduction gained each month. 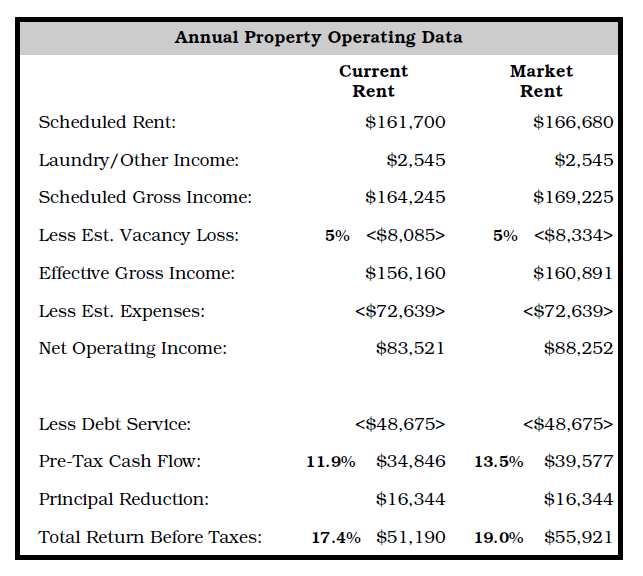 If an investment property cash flows positive after all Operating Expenses, this implies that the principal is also being paid down by the tenants. In this example, an investor only needs to come up with a 25% downpayment. Over a 30 year term loan, the remaining 75% balance will be paid off in full. So, although an investor only put in $293,750, by the end of 30 years, due to principal reduction, the investor will own the property outright. By claiming 100% ownership, the investor will have increased their equity position from $293,750 to the full $1,175,000 (assuming no price appreciation). Cash-On-Cash returns do not take into account any principal paydown. A common calculation used to boost yields is to add in the Principal Reduction portion on top of the net Cash Flow. The Total Cash Return Rate (TCRR) is the Total Return (before taxes) expressed in terms of percentage. TCRR takes the Total Return and divides it by the downpayment. 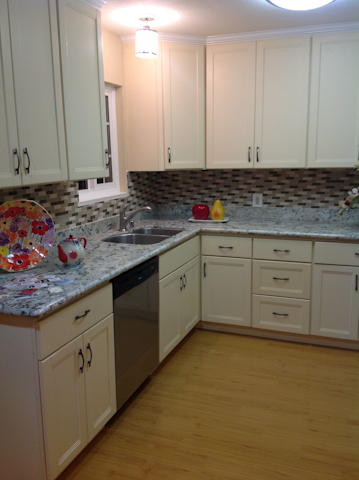 In this example, the Downpayment is 25%, or $293,750. In the Pro Forma statement, TCRR can be found under “Total Return Before Taxes”. The Gross Rent Multiplier (GRM) is a crude calculation used to estimate the value of a property. GRM comes in handy when you are evaluating the prospects of an investment property and are trying to come up with a suitable offer. Having knowledge of what the appropriate market GRMs should be will help prevent an investor from overpaying. For instance, if an investor knows that the GRMs around this commercial apartment typically hover around the 5-6 range, then they will immediately know that the seller’s offering price of $1,175,000 runs on the high side. By plugging in the appropriate GRM, the investor will know what the ceiling should be for any offers they make. Granted, the GRM will never tell the complete picture. It does not take into account: desirability of neighborhoods, condition of property, vacancy rates, etc., which are absolutely vital pieces of information needed to make an informed buying decision. GRM should only be used as a crude calculation, providing a cursory glance of the investment’s potential prior to any deep dive analysis. The Pro Forma statement above runs CAP Rate, Cash-On-Cash returns, GRM, etc. using current rent and market rent figures. The market rent return numbers show a higher return, and are provided to basically inform the prospective buyer that units are currently renting for below fair market value. All numbers calculated in this article ONLY used current rent figures found on the LHS of the Pro Forma table. Further, all returns generated do not take into account any additional closing costs that may be required. Great introduction to REI terms. I’ve learned so much from your other posts and hanging out on BP but this is a great starter post for anyone interested in REI. Yeah, BP is a wonderful community and great place to learn. I wrote this article particularly for those who want to get started in REI and wanted a one stop shop to learn the most commonly used terms for doing analysis work. Great post FI! Important to realize for all investors is that any information provided by the buyer must be taken with a large grain of salt. The more information you can get that can be corroborated, the better. I was evaluating a couple of 7-12 unit buildings near where I live and it was insane to me how unrealistic the numbers were as presented. Having a solid understanding of the true condition and vacancy cost of the properties is huge. To calculate true ROI, a buyer needs to add in all costs. Given the size of the property, I believe this property will not qualify for a standard 30-year mortgage. The commercial loans that I have access to are 5-5-5 ARMs, meaning the rate changes every five years. Generally, 30-year mortgages are available for 1-4 residential units. A property that contains even 1 commercial space or is 5+ units falls to commercial lending. The 15 year pay down can significantly affect the numbers. I just refinanced one of my properties to free up some of the equity. My new loan has a 15 year pay down and my payment is $336/month. With a 30 year mortgage, the payment would be closer to $236, which is significant. Obviously, if I can pay that loan off in the next year or so, I’ll have an additional $336/month cash flow to my bottom line, which is VERY significant. Good catch! You are right that this example uses a commercial building which would not qualify for conventional, residential 30 year fixed rate. The numbers don’t change (luckily), but it should say 3.7% fixed for 5 years, amortized over 30 years due in 30 years. Just so no one is confused, all this means is that the debt service will adjust after 5 years and it won’t be locked at a fixed rate for 30 years. Although the life of the loan is still 30 years, the rate readjusts after 5 years, changing the debt service numbers. This variable has no impact on Pro Forma numbers for Year 1, which is what the statement and calculations show. In this property, you likely need a commercial loan (over 4 units). Probably impossible to find a commercial loan that goes 30 years, anticipate 3-10 year of fixed interest rate then balloon or adjustments.. Closing costs will be significant and should be taken into account in cash on cash return. Any repairs after the purchase should also be taken into account with cash on cash. Thanks for the feedback. Yes, I made a mistake in assuming a 30 year fixed rate would have been possible for a commercial building. The correction has been made, and the loan is now fixed for the first 5 years, adjusting after. That is an expensive rent. These finances seem all but great, because this means that you need to rack in a huge amount of money to pay them off. I do agree that money in IS definitely greater than money out! But, it doesn’t seem that this will be the case. Thanks! The example I provided is merely an example and not an actual property I am considering purchasing. Also, by no means did I mean to imply it was a good deal, or bad deal. The purpose of the article is to provide an example on how to calculate numbers you would often find in a Pro Forma sheet. The calculations I worked out match what is on the statement. Great info, there’s a lot more to take into consideration than I would have thought at first. Is there a minimum ROI that makes a “good” real estate investment, or does it just depend on whatever return the individual investor is comfortable receiving. Yeah, this example might be a tad more complicated b/c it is for a commercial building that has 16 units. For a single family home, or 4-plex, the analysis wouldn’t be as complicated. The good news is, if you understand how all this works, those residential properties should be a piece of cake to work through. My own strategy is to go for diversification and find the right balance. I try and match my REI strategy to what I use when buying dividend stocks. I am not sure if this is a hypothetical example, or if you are actually buying. But here is my take. I will assume that you always look at leases, not rent ‘potential’ to figure current cape rate. You can always figure potential cap rate later. Your offer should be based on current numbers, not future numbers. Let the appreciation be yours, not the sellers. In that 45% expense ratio there would be 10% for maintenance, 5% for vacancy and 8% for management. Most of the rest of the expenses should have actual receipts or invoices. I larger cities, taxes are bad, and it’s hard to maintain a 45% ratio, so you have to adjust your offer to still get your desired cap rate. In a commercial building, look at the apartment classification, A, B, C or D. Each one requires a higher cap rate to make it worthwhile. An ‘A’ class building, 6% cap rate might be OK. With a ‘D’ category, you should get a minimum of a 12% cap rate. A ‘B’ should be at least 8%, ‘C’ should be at least 10%. If you are unsure of what apartment classifications are, and how to categorize a building, you have no business thinking about buying commercial properties. Keep this in mind always. You are buying to make you money, not make the seller money. Do not jump on a deal just because you need one, do it because you can make money. Even if things do not go exactly as planned. Remember, everything is selling at market value. If you are the only offer, always ask yourself what you see in the building that others do not. Maybe you have an inside edge? Maybe you have better turn-around skills, etc. If all you are doing is buying turnkey and bringing in a property manager, you are no better than anyone else and might suffer in the long run. You have a lot of experience and knowledge… Have you thought about writing a book, or blog, if you haven’t already? Perhaps you would be interested in doing a guest post to share some tidbits of wisdom? I’m sure readers (and myself) could learn a thing… or ten. I’m bookmarking this for future use. Very concise, one-stop-shop for a multi-family breakdown. Would the same apply to something as small as a duplex, or is this sort of analysis really only appropriate when looking at apartments? The calculations are the same. The classification of the neighborhood can be similar (A-D), which would indicate what you would expect in terms of cap rate and ROI. Most investors buying duplexes do not know much about investing, only what their Realtor tells them. Most Realtors do not know much about investing, only what their commission tells them. Ask your realtor, how many investment properties they have, before taking their advice about investment properties…. Yeah, this analysis would work for any property, even a single family home. With commercial, it’s really the loan terms (debt service) and Operating Expenses (see above section) that are more complicated to figure out. I don’t even use GRM for residential stuff. Mostly, just cash on cash return, and monthly cash flow is what I focus on. The expenses for residentials are usually straight-forward (mortgage, property taxes, insurance, HOA, utilities (mostly for multi-family… gas/electric/water/landscaping), property management) and budget room for vacancy/maintenance. Helpful stuff – thanks for walking through the pro-forma statement! I know it can be intimidating for someone that’s never seen one or isn’t too confident with reading statements or spreadsheets. I’m sure this was helpful for a lot of readers. Thanks for the simple lesson FI, I really like how you broke everything down step by step and made it simple enough for someone like me to understand. Thanks! It’s helpful to have for me as well, especially when I’m talking to local investors and they want to clearly see how the numbers get calculated. Once you learn the terms you tend to take them for granted, but I always have to remember what it was like when I was first starting out. Thanks for this info FI, part of the problem with investing in real estate that I am already having is following the numbers and keeping emotions in check. At the moment I am looking into buying a property but I am not sure what targets I should be looking for. The cash on cash return (including debt) that I calculate for the property is 7.9%. Given a mortgage at 5.25% and 15 years, the total cash return rate of 25.4%. Do these numbers sound like a decent investment? 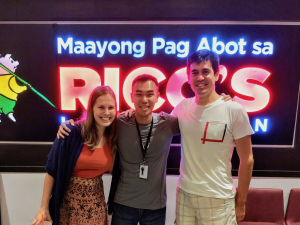 I live in the Cayman Islands and while I’m not sure if the property market is the best investment, part of the reason I would like to do it is because owning property gives me a much better chance at obtaining permanent residency here, otherwise I would have to leave after 8 more years. Returns will vary from location to location, so it’s difficult to say what a “good” return is. I know in the Bay Area, anyone would jump on a 7.9% ROI. If you go out in the Midwest, 7.9% is probably considered on the lower end of returns possible… I’m not sure about the Cayman Islands as I have never researched into that area. You would have to study the local market in order to determine what is a typical return found there… Also, it is important to take into account things like location, and potential for appreciation. Appreciation is a very speculative game, but if the cash flow is good and you know there is potential for appreciation there as well, it’s just another positive in the analysis. May I have your permission to use your sample operating data in an online course for real estate agents I will use in Florida only? Great post! Thanks for this info. part of the problem with investing in real estate that I am already having is following the numbers and keeping emotions in check. At the moment I am looking into buying a property but I am not sure what targets I should be looking for. The cash on cash return (including debt) that I calculate for the property is 7.9%. Given a mortgage at 5.25% and 15 years, the total cash return rate of 25.4%. By the way, I’ve found PDFfiller – online service for forms filling. It’s pretty easy to use and pretty cheap. You can find fillable a form here “https://goo.gl/AO9P43“. This article is a really great guide at reading pro forma statements. This will be really helpful for investors or property managers who are new to this industry , This article will help learn reading pro forma statements quite easily. Your second Cash on Cash example shows the formula should be divided by the downpayment yet you use the purchase price to equal the 7.11% to match the effective CAP rate – Why?